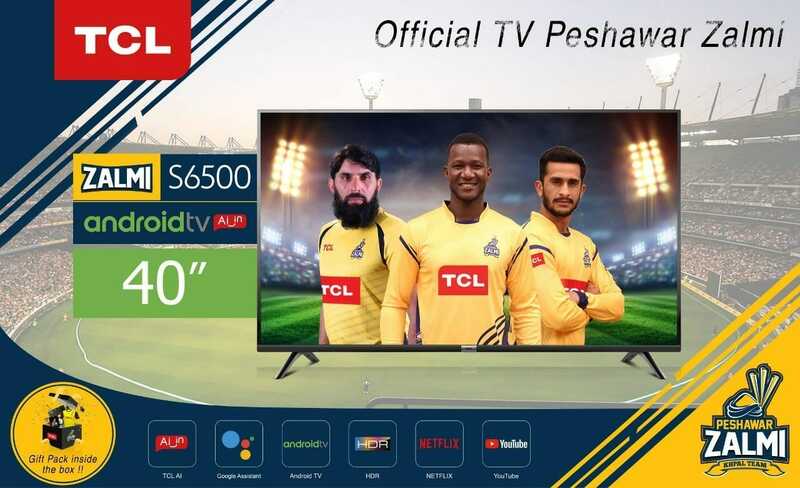 The Chinese electronics manufacturer, TLC, has just come out with a Zalmi Special Edition TV that is aimed towards the upcoming 2019 PSL. There are two new TVs launched by the popular TV brand in different sizes. TCL enjoys a vast market share in Pakistan which is primarily the result of their excellent quality products coupled with a budget-friendly price. TCL rose to prominence in Pakistan after they introduced their very first 4K TVs a few years ago that delivered promising performance at a competitive price point. The two new PSL themed TVs comprise of a 32-inch and 40-inch model. The new Zalmi TVs are Smart TVs featuring Licensed Android OS with built-in AI through Google Assistant, comes loaded with Google Play Store and features a built-in Chromecast. It also comes equipped with FHD display to provide an HDR visual function and Dolby audio technology for surround sound providing consumers an immersive viewing experience. The 32-inch model goes for 31,990 PKR while the 42-inch model costs 42,990 PKR. Included with every new Zalmi TV is a special edition Peshawar Zalmi/TCL branded packaging which has a gift bag inside containing Zalmi-TCL branded merchandise. Moreover, besides the Zalmi Gift Pack inside every TV, all customers who purchase the Zalmi TV will be entitled to a Lucky Draw for which the prizes include 2 Winners to win a “Money Can’t Buy” trip to Dubai to watch a Peshawar Zalmi match and also meet and greet Zalmi players behind the scenes, Official Signed Zalmi Merchandise and Zalmi TVs as well.